« Draw and Paint Herbs! Making vegetables and plants irresistibly interesting to the next generation is the goal of Botany on Your Plate: Investigating the Plants We Eat, a ready-to-use curriculum written by Katharine D. Barrett, Jennifer M. White and Christine Manoux. Lesson 1: Let’s Become Botanists! – During this lesson, teachers will determine students’ prior knowledge about plants and learn about the plants their students eat. Students create the botany journal they will use throughout the unit and learn about the “plant snack process”. A recurring feature, the “plant snack” activity encourages students to “taste and describe” the fruit and vegetables they are learning about. Lesson 2: Roots – Students learn about roots and their function through observation, dissection and drawing. Suggestions about how to relate this lesson to math, nutrition, cooking, social science, language arts and plant propagation are provided. Lesson 3: Stems – Students learn about stems and how water and nutrients travel through plants while dissecting and drawing stems. Students learn about the scientific process while conducting an experiment and learn about products made from stems. Suggestions about how to relate this lesson to math, nutrition, cooking, social science and language arts are provided. Lesson 4: Leaves – Leaf structure and photosynthesis are the focus of this lesson. Dissection and drawing again play an integral role. Suggestions about how to relate this lesson to math, nutrition, social studies and language arts are provided. Lesson 5: Flowers – Students study flowers and learn about pollinators while dissecting flowers and drawing floral structures in their botany journals. Suggestions about how to relate this lesson to math, nutrition, pollination ecology, cooking, social science and language arts are provided. Lesson 6: Fruit – A study of two types of fruit leads to discussion about seeds and seed dispersal. Suggestions about how to relate this lesson to math, nutrition, ethnobotany, social science, cooking and language arts are provided. Lesson 7: Seeds – In this lesson, students explore seeds in more detail. They learn about a seed’s function through dissection and drawing. Suggestions about how to relate this lesson to math, nutrition, cooking, gardening, social science, and language arts are provided. Lesson 8: Plants – Top to Bottom – A recap of the many elements in this unit, students end the eight-lesson series drawing and writing about plants in their journals. Background information about plant biology is provided for teachers, as are copies of the handouts required for each lesson. A helpful glossary is also included. Botany on Your Plate: Investigating the Plants We Eat is an invaluable resource that should be in every classroom or at least in every school library. Barrett, Katharine D. and Jennifer M. White and Christine Manoux. 2008. Botany on Your Plate: Investigating the Plants We Eat. Burlington, VT: National Gardening Association. 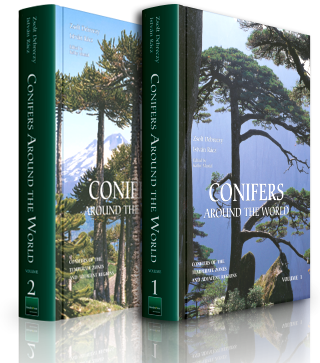 Botanists and illustrators strive to document conifers around the world. National Environmental Education Foundation's Nature Center Guide. Find a trail for hiking, walking, cycling or inline skating. The Rails-to-Trails Conservancy and its volunteers work to convert unused railroads into trails for healthful outdoor activities. Search their national TrailLink database to locate a trail near you. Locate trails for hiking, cycling, climbing, and many other outdoor activities. © 2007-2019 by Tania Marien. All rights reserved. Unauthorized use and/or duplication of this material without express and written permission from this blog’s author and/or owner is strictly prohibited. Excerpts and links may be used, provided that full and clear credit is given with appropriate and specific direction to the original content. Artists retain the copyright to their work. The ArtPlantae® logo is a registered trademark.